Bench Scale Crystallizer | KATSURAGI INDUSTORY CO.,LTD.- Dryers,Drum Flakers,Concentrators,Crystllizers. This is a bench scale crystallizer of effective volume of 3 lit. for process development as preliminary stage of stainless steel made pilot scale crystallizers of effective volume from 50 to 500 lit. 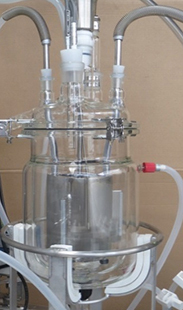 This bench scale crystallizer can measure MSZW and crystal growth rate and make various mode of operation, such as batch or continuous, by having glass made jacketed flask. 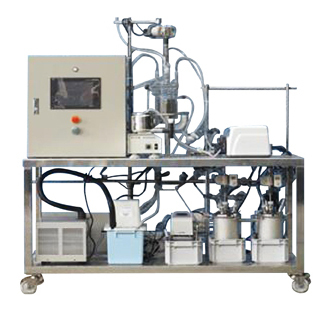 Operation mode, such as batch or continuous, direct or vacuum cooling, concentration crystallization, can be selected on a touch panel. Any temperature difference by heating or cooling can be made locally. Scaling and nucleation can be observed from outside of the crystallizer. Draft tube and impeller of agitator can be changed. Influence on crystal quality by agitation can be observed. Pressure and temperature is PID controlled. Data of temperature, pressure, flow rate rotation speed and power can be stored.